< Using my all-powerful abilities of clairvoyance and precognition, I foresee that next week's meeting (SeattleCosmicGameNight20030524) -- which I incidentally predict will take place at Dave and Kathy's house, rather than that of Tim Higgins, as scheduled -- will have ''exactly'' as many attendees, as the fine weather continues. 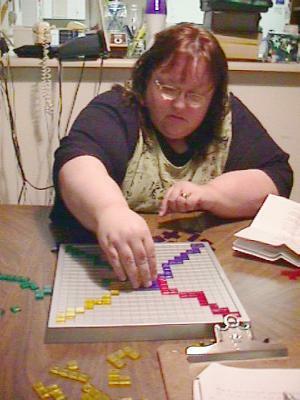 > Using my all-powerful abilities of clairvoyance and precognition, I foresee that next week's meeting ([[SeattleCosmicGameNight20030524]]) -- which I incidentally predict will take place at Dave and Kathy's house, rather than that of Tim Higgins, as scheduled -- will have ''exactly'' as many attendees, as the fine weather continues. I am aware that... members refuse to turn out in cold weather; that they do not turn out in wet weather; that when the weather is really fine, it is impossible to get them together; that the slightest counter-attraction,--a hockey match, a sacred concert,--goes to their heads at once. Using my all-powerful abilities of clairvoyance and precognition, I foresee that next week's meeting (SeattleCosmicGameNight20030524) -- which I incidentally predict will take place at Dave and Kathy's house, rather than that of Tim Higgins, as scheduled -- will have exactly as many attendees, as the fine weather continues. Alex Rockwell was the first to show up, around 5:05. Alex and I waited for Marty to get out of the shower, and then we three waited for someone else to show up. Finally we decided on a quick game of 6_Nimmt!?. This is the kind of highly tactical game I do well at, and I won. Alex had not played before, but the scoresheet I have shows he learned as he played, taking 40 points on the first turn (bad) but only 2 on the last (good!). I chose a water bottle as my prize -- slightly disproportionate to the "size" of the game, but fewer people have been choosing them than we predicted, so we had a surplus. While I dont think I got quite 40 points in one round in 6 Nimmt (I think that was my score after 2 rounds), the beginning was pretty bad for Marty and I, and Ron didnt take a thing until round 3 I believe. It was a battle for second at that point. I checked the scoresheet, and we're both partly wrong, Alex. You did get 40 on one round, but it was your second round. To be precise, over a four-round game, you scored 8+40+7+2=57, Marty scored 28+11+20+19=78, and I scored 0+0+7+12=19. Chad showed up toward the end of 6 Nimmt!, so we played a game of Blokus. Chad had never played before, so we gave him the first turn, because score in Blokus is highly dependent on turn order. The rankings in the table above closely match the turn order, except that I was the second player and Alex was the third. Sure enough, Chad, the first player, won, even though it was his first time. There's got to be a clean fix for this bias toward the first player; meanwhile, Blokus is fun enough that we keep playing it anyway. I think that maybe player 1 should have to play a 3 long piece on turn 1, and player 2 play a 4 long piece, on their first turn. This would make them get to the center later, neutralizing their advantage. Thats just a guess on how to balance things.....dont know if it would work. 1. Alex plays his cards close. 2. Look at that tableau. Someone's gonna get it! AlphaTim Schutz showed up around 6:20, and the five of us played another game of 6_Nimmt!?. This time Tim was the newbie. He mixed the cards he took with cards from his hand on the first round -- but then, we hadn't told him to keep them separate. We sorted out the mess and played on. I tend to play 6 Nimmt! somewhat intuitively and found it difficult to move quickly from a three-player game to a five-player game -- very different games tactically. I managed to adjust as the game went on, taking 22 points in the first round, 10 in the second, and only 4 in the third. It was too late to catch up, though; Tim broke 66 points and the game was over. As Alex (who won) asked, "There's no way you can reduce your score in this game, like shooting the Moon in Hearts?" The strategy in this game is keeping your options open. 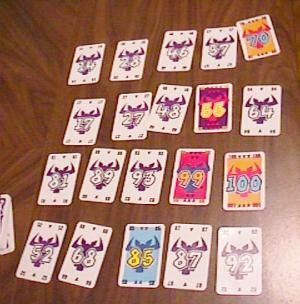 That is, trying to keep cards wit ha variety of numbers in your hand as much as possible, and playing cards out of values where you have larger clumps. This way you can have a greater chance of having some number that is safe to play once things become very dangerous. Thats about all I can say for now, after just 2 palys. For want of a word somewhere between "strategy" and "tactic", I would still call these "tactics". They're not good over the course of a game, since the tableau is wiped and the whole deck is reshuffled at the end of each round. Maybe "stratagem" is the word I want. Mer and Kisa showed up. We chatted for a few minutes about the movie The Matrix: Reloaded. (Marty and I think the original is a shallow action flick pretending to be a treatise on ontology.) Then we broke into two groups of three, playing Queen's_Necklace? and Paris,_Paris?. I didn't want to play either, so I sat out. 1. Taxiing around the City of Light. 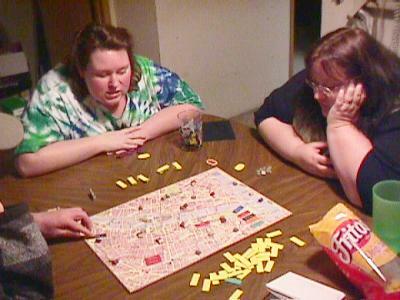 The other three players played Paris,_Paris?. I don't know much about it, but someone (Meredith?) told me it was like Web_of_Power? -- bleah, another MajorityPlacementGame?. Mer, who won (and had already played several times) likes it a lot, though; perhaps she'll comment on it. Pop_Smarts? is a pop culture trivia PartyGame that Marty and I picked up at a Wizards of the Coast store for 75% off. Looks fluffy, but has nice bits. 1. Novice Alex, Saint Ron, and Fr. Kisa. Next up, several of us tried Mystery_of_the_Abbey?, based on the book The Name of the Rose by Umberto Eco -- supposedly a DeductionGame?, but with a lot of chaos. 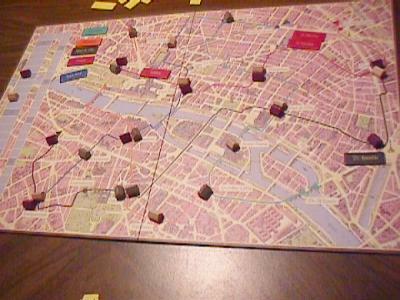 Even though I won, I prefer the purity of a game like Sid Sackson's Sleuth?. In this game, not only is there a move-around-the-board mechanic, as in Clue? (though fortunately not a RollAndMove? mechanic), but there are action cards that let you do things like swap hands with another player, or even better, look at another player's hand without revealing yours. Since your hand consists of monks in the Abbey that are (from the perspective of the other players) suspects in the murder you're trying to solve, the action cards are powerful, and we found that they played a far greater role in the game than deduction was supposed to. For example, at one point we estimated that Alex had seen fully 2/3 of the monk cards in the game, and he was able to rule out a few more with deduction. The lunatic is all id\xE9e fixe, and whatever he comes across confirms his lunacy. You can tell him by the liberties he takes with common sense, by his flashes of inspiration, and by the fact that sooner or later he brings up the Templars. Playing without the Library,and with 3 turns per round instead of 4, but moving 3 spaces per turn instead of 2, improves this game a great deal, I think. Ron had a good guess of the guilty to win the game, based on some questions that were asked that made that character (novice Thomas), seem much more likely to him than the others that had not yet been eliminated. One thing we neglected to do in this game was to go make revelations, which are the key to scoring. Not one was made. Usually, people will rush off to the capitulum a lot to make revelations as educated guesses and try and improve their score. But this was all of our first play, and we didn't know that. 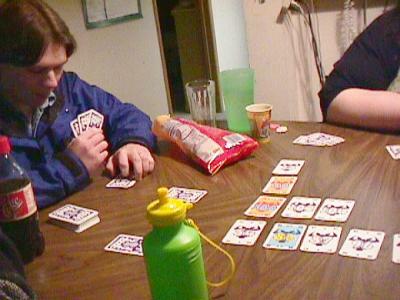 Meanwhile, Marty, Mer, and Tim were playing an as-yet-unnamed Alpha_Playing_Cards? game prototype of Tim's design. Tim stole a couple of mechanisms from the word game RPM?, which has a revolving board. In Tim's game, players attempt to empty their hands (which count against them) and to complete and score the words they are passed, while passing their own words in a circular motion. Marty, a word person (an editor), won by a wide margin. 1. Four players full of beans. Dave Howell arrived around 9:30, informing us of a startling fact he had learned from the sign on the Office De(s)pot store at the bottom of our hill: Furniture Supplies Technology. He brought some rolls of brass discs for the PrizeBag (they can be used instead of glass stones, or as pawns, and they look cool). He also brought some decks of casino playing cards from his recent trip to Las Vegas for the PrizeBag. He said if people chose them as their prize, they could then choose to donate them to the GamesToTheRescue project. Nifty! 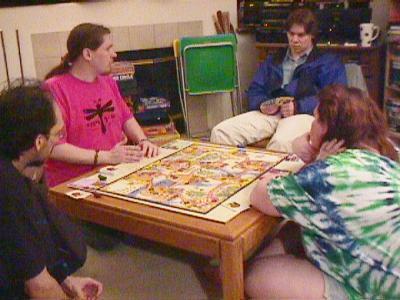 Dave, Mer, Alex, and Kisa decided to play Bean_Trader?, which Marty thought looked like a TrainGame? with beans. Was it? How many decks did Dave bring? Without actually counting, I'd estimate 10-12 decks. 1. Quandary's excitingly chunky bits. 2. Tim puts Marty in a terrible... well, you know. 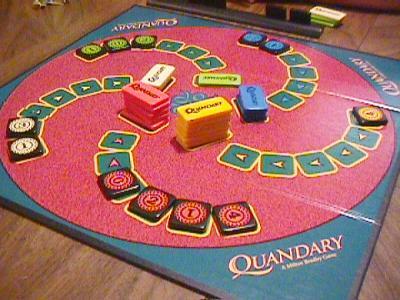 The rest of us played Reiner Knizia's mathematical nail-biter Quandary (a.k.a. Flinke_Pinke?). We agreed to play only three rounds instead of the standard four because Chad had to leave at 10:30. I fell badly behind in the first two rounds, as I was first afraid that someone would zero out a row if I placed a high-scoring token on it, so held back too long, then took the risk in the second round only to have my row zeroed out as I had feared in the first round. I recouped some of my losses by watching the leading players and following their lead in which colours of bricks I took from the center, but too little, too late. Chad won this one by a wide margin, then went home. Chad, do we owe you a prize? Next up, Tim, Marty and I played Shipwrecked?, a very thinly themed auction game set on a desert island. Fluffy but odd. Marty asked why some cards, like monkeys, brought income on your turn, but people didn't. Tim, ever able to see the theme in the mechanics, replied, "That's just someone you have to talk to -- and share your monkey with!" 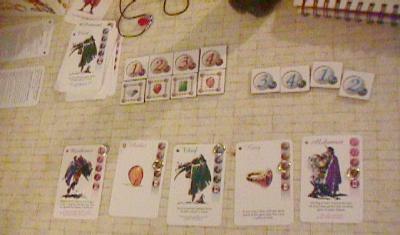 I lost most of my money in a bid war with Tim on the first turn. Tim never recovered. I did to some extent, but Marty held onto her money and was able to win a crucial auction that let her break 150 points and win the game. 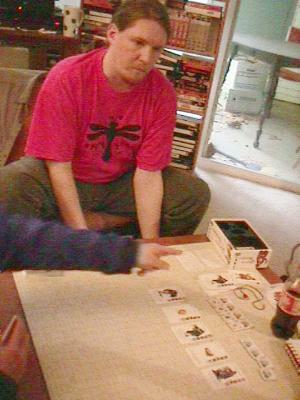 Next up was another playtest of Tim's unnamed Alpha_Playing_Cards? game. Marty won again, by an even wider margin than before. This was my first time playing it. I thought the game was fun but needed a bit of work, such as something fair to do when you can't complete a word and can't or don't want to pass it on. Marty donated her casino cards to GamesToTheRescue, becoming the first player to do so. 1. One tiny tyrannosaur, with all the frills. 2. Terrible tabletop battle of the titans. After Bean_Trader? and the second Alpha playtest finished, we all sat around yakking for a while. 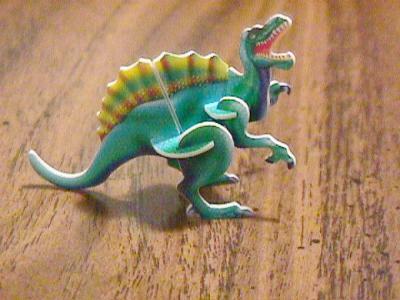 We played with Marty's dinosaur prizes (see above). I speculated to Tim that the multi-purpose cards in James Kyle's game HellRail? may have stimulated him to design the piecepack. Marty and I talked with Mer and Kisa about the science fiction special The Future is Wild, which was going to air the next day on the Discovery Channel. We looked at the book for The Future is Wild, and Marty informed Mer and Kisa, "In Muscle Shoals they got the Swampus." Mer and Kisa left around 12:15 AM, no doubt groaning inwardly. Dave and Alex, who had been chatting about games, left around 12:25. Thanks to everyone for a quiet and rewarding game night. Thanks in advance to Chad McDaniel for the photos he shot. See you in two weeks, because my clairvoyance and precognition tell me I'll get lost and won't make it to Dave and Kathy's next week. We were mostly chatting about rating systems, comparing the one on Boardgamegeek to one which Dave has developed. He thinks that having more than 7 rating categories (i.e. 1 to 10 scale) is too many for people to be able to differentiate between them clearly, and that the ratings should be words, nto numbers. I agree, this would standardize the ratings on Boardgamegeek a lot. Oh yeah, I remember now. If I recall my social psych classes, psychologists have found that a seven-point scale is just about optimal for polls and surveys. -3, -2, -1, 0, +1, +2, +3. For example (starting with -3), Very Bad, Bad, Slightly Bad, Neutral, Slightly Good, Good, Very Good. It seems to match the way people think. So I agree with Dave. There's a pretty good trailer for The Future is Wild at www.thefutureiswild.com, but you need a fast connection and Macromedia Flash installed to view it. It does include a beautiful shot of the fabulous Squibbons -- intelligent arboreal squid -- swinging from tree to tree, though. Saturday, 24 May 2003, 5:00 PM at the house of Dave Adams and Kathy Kizer in Tukwila. Come play for fun and FABULOUS PRIZES from the PrizeBag!